These were some of the opening words spoken by Major General Stefano Del Col, UNIFIL Head of Mission and Force Commander, during the launch of the UNIFIL photo and multimedia exhibition last night, 24 September, at Beit Beirut cultural centre in the heart of Lebanon’s bustling capital city. The exhibition is a vivid photographic journey in this striking venue. 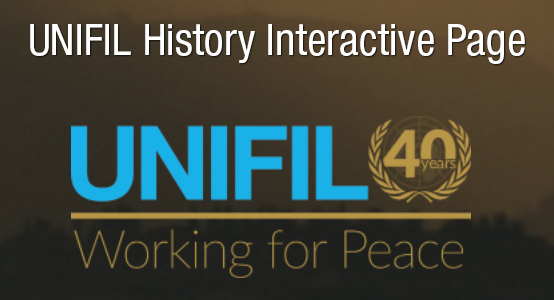 The collection of 62 images marks International Day of Peace as well as the 40th year since UNIFIL’s deployment in 1978. The exhibition of photographs, videos and children’s drawings are a lens into south Lebanon. They depict the resilience of the Lebanese people and the deployment and work carried out by the UNIFIL peacekeepers alongside these communities since 1978. The Beit Beirut cultural centre is itself an architectural testament to overcoming conflict. Constructed from rubble from Lebanon’s civil war, now contrasted with modern steel and glass, this arts centre shows the scars of conflict as well as a light-filled vision for the present. The exhibition will keep its doors open to the public from Tuesday, 25 September till Friday, 28 September from 11:00 to 18:00.